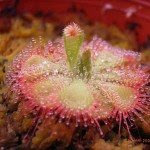 Petpitcher.com is an excellent reference point for carnivorous plants. 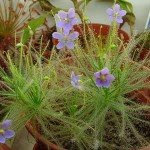 I had a beautiful little carny plant - I think it was a drosera- it was great fun for a while and was even sending out pups but I killed it by trying to transplant it. One time I heard a general rule for carnivorous plants: if they look happy DON'T move them. I think that was true with mine. I usually don't like carnivorous plants, but those in the photos looks cool. By the way my website is up -right now I am trying to think of a new name for it. Firstclassart.com is what the name of it now, I use to use it for my art work. I put a link to your site for anyone who is interested in terrariums. I like Carnivores but they are not always easy to grow but that looks a good supplier.